Depression is a leading cause of suicide, a televised Kenyan town hall discussion heard in March 2019. This was according to a 2017 World Health Organization report, host Trevor Ombija said during the Burden of Depression current affairs show. It was broadcast on Citizen TV, the country’s most popular channel. “That same report ranks Kenya as number six in Africa in terms of depression levels,” he added. Suicide was also “a leading cause of death among youth”, the audience was told. This was linked to depression. But does available evidence bear this out? As we found out after weeks of digging, data on suicide in Kenya is significantly unreliable. And that’s a major obstacle to finding solutions. Over a thousand suicides – or 302? The WHO report mentioned in the show is titled Depression and other Common Mental Disorders: global health estimates. It estimates that 4.4% of Kenya’s population – 1,952,981 people – suffered depression in 2015. Kenya does rank sixth in Africa for the number of people with depression, but places eighth for the share of population suffering the disorder. The report doesn’t give an estimate of suicides. The UN health agency’s most recent suicide data on Kenya is from August 2018. This estimates the suicide rate as 3.2 cases for every 100,000 people in 2016. Using Kenya’s official population of 45.4 million people that year, this works out to 1,453 suicides. But according to national statistics there were 302 suicides in 2016 (up from 221 in 2015). That’s less than a quarter of the WHO estimate. What’s the source of WHO data? How did the WHO arrive at its estimate? For months, Africa Check asked the health agency for its source data but received little feedback. The best we got from the WHO’s Kenya office was that most of the data on suicide in Kenya was prepared at their headquarters in Geneva. A review of the agency’s research methods showed that where there was no data it drew from analysis by the Institute of Health Metrics and Evaluation, an independent research centre at the University of Washington. 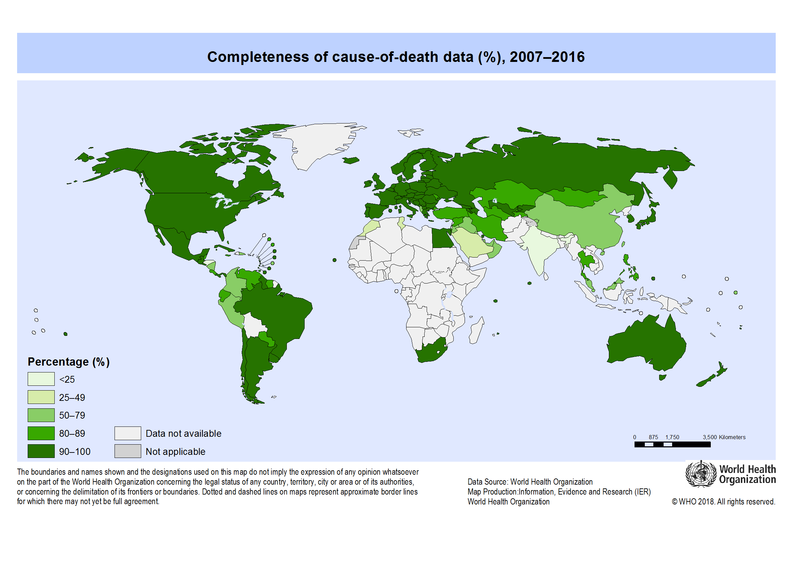 This “made use of available death registration data as well as other sources of information on deaths, covariate regression modelling, and patterns of causes of death for similar countries”. In its 2017 report, the WHO said only 60 of its member states had vital registration data good enough for the direct estimate of suicide rates. Kenya was not among them, due to a lack of data on the causes of death. Joyce Nanjala, who works in the WHO’s Kenya office, said the lack of a “national survey” on suicide and “very limited surveillance data” made it difficult to track suicide trends. “It would be helpful for the country to conduct systematic review of local epidemiological studies to have a better understanding of the local suicide trends,” she told Africa Check. Police data puts Kenya’s cases of suicide in 2017 at a provisional 421, according to the 2018 economic survey by the Kenya National Bureau of Statistics. Kenya’s penal code states that “any person who attempts to kill himself is guilty of a misdemeanour”. Further complicating the picture, less than half (41.2% in 2017) the deaths in Kenya are officially recorded, according to the statistics agency. Most of Kenya’s data on suicides comes from “lay reporting” and there is little coded data, Samuel Cheburet, the head of the civil registration and vital statistics unit at Kenya’s health ministry, told Africa Check. So even if a person kills themself “in a traffic accident, or in a homicide, the intention is not recorded”, Cheburet said. All the experts we spoke to highlighted the lack of accurate data. Inaccurate coding of cause of death data meant most cases of suicide were not captured, Prof David Ndetei, a mental health expert at the department of psychiatry of the University of Nairobi, told Africa Check. There isn’t a “specific place to get reliable suicide data on Kenya because it is not routinely collected in our health systems”, said Mary Bitta, a researcher at KEMRI-Wellcome Trust, a health research institute in Kenya and doctoral candidate at the University of Oxford. Does suicide go up as the Kenyan economy goes down? In an October 2018 story, The economics of suicide, Kenyan daily the Star claimed that in 2017, the country recorded its “highest suicide rate” in 10 years – 421 in every 100,000. This, it said, coincided with Kenya’s lowest economic growth and highest inflation in five years. But is there an argument that the number of suicides in Kenya is linked to the country’s economic fortunes? It’s not easy to draw a direct relationship, said Dr Lincoln Khasakala, a clinical psychologist at the University of Nairobi’s department of psychiatry who has studied suicidal behaviour. But there might be “an association”, he told Africa Check. “With low socioeconomic status we tend to develop other mental health problems, and those ones make suicide seem like an easy way out. Lack of support from others, feelings of hopelessness, substance abuse and desperation can lead to mental disorders. A reversal of economic status could trigger stress leading to depression, Khasakala said. Some people try to cope through substance abuse. In the end, he added, it would be difficult to say the economy was the sole cause of an individual’s suicide. How a person reacts to money troubles is partly influenced by how much support they get from family and friends, he said. Does Kenya’s lack of accurate suicide data have consequences? Misleading data could cause “unnecessary alarm”, Nairobi University’s Ndetei told us. He is the founder of the Africa Mental Health Foundation and has studied suicidal behaviour in Kenya’s youth. And, he said, underestimates could mean not enough was done to prevent suicide.